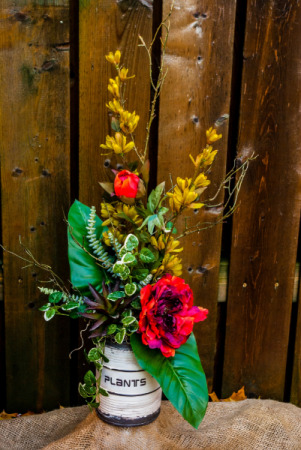 This silk arrangement stands about 30 inches tall and has lovey earth tones throughout. Lush greens, succulents, twigs and a vibrant peony. This arrangement would look great in almost any room! This luxurious beauty gift basket contains all locally made bath and beauty products from Natura Soap Company. They are made with all natural ingredients, and smell phenomenal. Each basket contains 2 bath bombs, 2 shower bombs, a bar soap, two wax melts, two lip balms, a tub tea, plus a bonus item. A $70 value for $65! Why not add a box of chocolates to top it all off?! 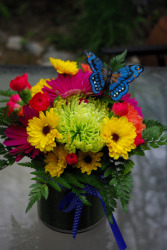 Looking for a centerpiece that can last through the whole year? Look no further. 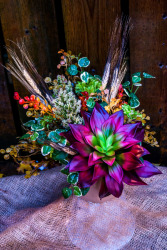 This centerpiece has rich earth tones, and a great natural look. It is arranged in a cement pot. Perfect for the nature lover in your life!